Congressman Ron Paul’s third-place finish in Tuesday’s Iowa Republican Caucus was a remarkably strong showing for a candidate who has so little in common with mainstream Republicans. Perhaps the nation’s most politically unique congressman, Paul shares policy stances with conservatives, liberals, and libertarians, while differing markedly from all of them. 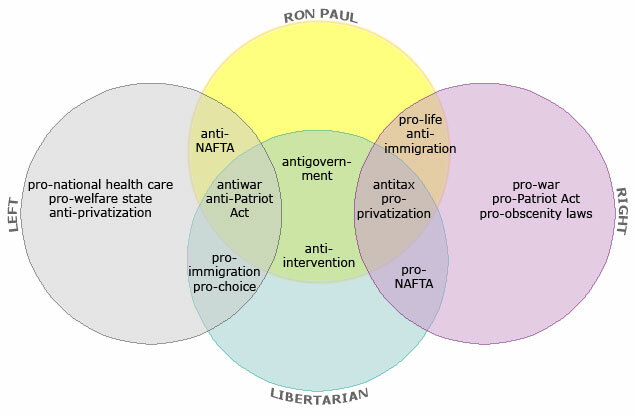 So where does Paul fit in the Libertarian universe? Minarchists: Archrivals to the anarcho-capitalists, they support a minimalist version of government: Let the state handle roads, policing, and defense—but nothing more. Many, including Ron Paul, view the Constitution as the ultimate minarchist document. Religious Libertarians: Worship deities of their choosing, care about politics primarily as it affects religious freedom. In 17th-century England they were Puritan Roundheads. In 21st-century America they’re Mormons. Paleolibertarians: Old-schoolers who despise the neolibertarians for selling out to the system. Also think atheism is overrated. Technolibertarians: Extropians, transhumanists, sci-fi-fans, they strive to transcend humanity’s meat-puppet limitations and take self-determination to the final frontier. Around 9 percent of Americans are libertarians. What makes them tick? 59% say they are satisfied financially. 82% say government is almost always inefficient and wasteful. 70% say they’ll vote for a Republican in 2012. 36% say they don’t know where Obama was born. 38% regularly watch Fox News. 60% say we shouldn’t give up privacy to be safer from terrorism. 63% say there’s no solid evidence of global warming.